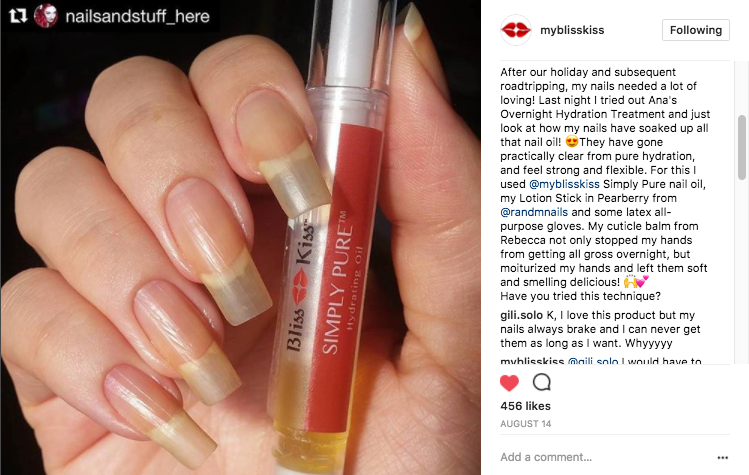 We've had so many people asking for high-quality nitrile gloves that work well with Bliss Kiss™ products to help you get the most out of an Overnight or Mini Hydration Treatment. We Found Some Great Gloves Just For You! Your body heat helps warm up the oil so you absorb more. Helps to hydrate both your nails and the skin on your hands. Sturdy. We tested a lot of gloves that would tear even when just putting them on. That was completely unacceptable. So we didn't stop until we found gloves that are sturdy. Flexible. These gloves are comfortable and will move with you. Pretty. Yes. This is important! One of our favorite features of these gloves is the gorgeous pink with pearlescent sheen! Plus! You will be supporting Breast Cancer Awareness and Research. The manufacturer of these gloves donates a portion of all proceeds to support research and provide education and early detection screenings for those in need. Harder isn't stronger when it comes to nails. If you just have hard nails, your nails are more likely to break - the really kind of painful break, too. The fastest and easiest way to get longer stronger nails is to hydrate them. And the fastest way to hydrate your nails is with the Bliss Kiss™ Overnight Hydration process. Give your hands and nails some hydrating TLC. Get your gloves and get your hydration on! We promise you'll be delighted with your results. Make sure you've got your Simply Pure™ and Simply Sealed™! These beautiful pink gloves are latex-free, textured and give you a good grip and work with smart phones and touch screens. You'll also notice how surprisingly thick and durable these gloves are, too! They are 33% thicker than normal nitrile gloves to protect medical professionals hands when treating patients with chemotherapy. *If you are still having trouble deciding, always opt for the larger of the two sizes. Slightly loose is better than too tight! Literally. You will likely see your tips turn clear after a hydration treatment. This is GOOD. 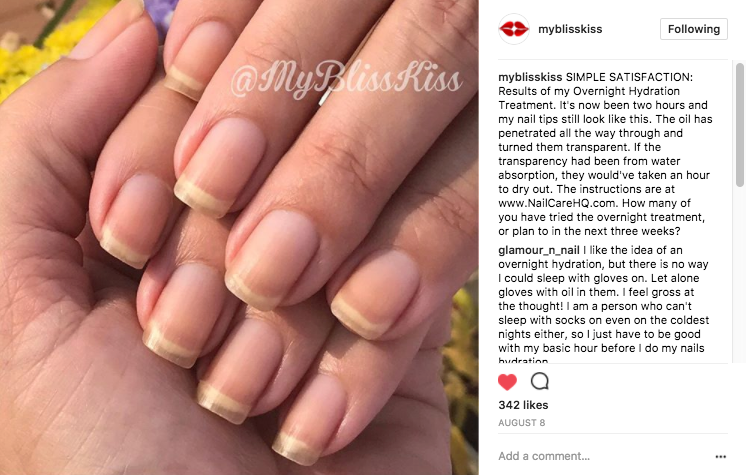 Unlike tips clear from being soaked in water where your natural oils that hold the layers of your nails together get stripped away, clear tips after a Hydration Treatment indicate STRONG, FLEXIBLE, HYDRATED NAILS. "The oil has penetrated all the way through and turned them transparent. If the transparency had been from water absorption, they would've taken an hour to dry out. Some people are blessed with it... Now everyone else can get Blissed with it. I love this gloves so much! they are thicker than the normal ones and I'm not afraid of breaking them when I'm putting them or taking them out plus with the help of this my hands get super soft with the hydratation treatment.